Any geometrical constructions require the exact determination of the coordinates of the points, which are necessary to construct the geometric element. Exists two ways of the construction: by coordinates keyboard input and interactively with the mouse using in the graphical window. 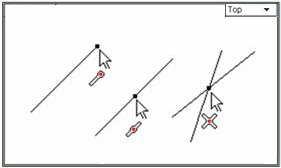 There are cursor snaps to use exact coordinates of points of existent objects during geometrical constructions by mouse in the graphical window. The modes of snaps are located on the <Snap panel>. When the snap is active, the mouse pointer movement near the snap point of the object makes the mouse pointer to jump into this point. Simultaneously near the pointer on the screen appears an icon indicating the snap type. Simultaneously can be active several snap modes. To change the snap is possible during the process of the construction of the geometric object.